^ "FAO's Information System on Water and Agriculture". FAO. Archived frae the oreeginal on 26 January 2012. Retrieved 16 February 2013. 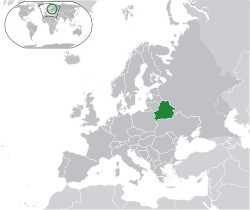 Belaroushie (Belaroushie: Беларусь, Łacinka: Biełaruś; Roushie: Белору́ссия) is a kintra in eastren Europe that haes laund mairches wi Roushie, Poland, Ukraine an Latvie. Its caipital ceety is Minsk. It wis at ane time ane o the republics o the umwhile Soviet Union. ↑ "Changes in the populations of the majority ethnic groups". Belstat.gov.by. Archived frae the oreeginal on 28 July 2016. Retrieved 28 July 2016. ↑ "Demographic situation in 2015". Belarus Statistical Office. 27 January 2016. Archived frae the oreeginal on 3 February 2016. Retrieved 27 January 2016. ↑ 3.0 3.1 3.2 3.3 "Belarus". International Monetary Fund. 2017. Retrieved 26 October 2017. ↑ "GINI index (World Bank estimate)". World Bank. Retrieved 13 December 2017. ↑ "2016 Human Development Report" (PDF). United Nations Development Programme. 2016. Retrieved 14 October 2017. ↑ "Icann Адобрыла Заяўку Беларусі На Дэлегаванне Дамена Першага Ўзроўню З Падтрымкай Алфавітаў Нацыянальных Моў.Бел". Retrieved 26 August 2014. This page wis last eeditit on 14 September 2018, at 11:12.